1). CPAP motor – The CPAP motor is basically a small compressor. These are now designed to be very quiet. It draws in room air and gently pressurizes it to deliver the perfect amount of air pressure that you need to clear the obstruction in your airway. The air intake portion of the machine has a replaceable filter that screens out particulates and impurities. Most newer CPAP machines also have a small water tank that, when turned on, heats up the water to provide moisture to the air you breathe in. These built-in humidifiers are ideal for people living in dry climates and those that frequently wake with dry mouth or throat. 2). CPAP Hoses- The hose is simply the delivery device that transports the pressurized air from the motor to the CPAP mask. While most hoses are 6 feet in length, the diameter of the hoses can be different depending on the machine that one uses. Most hoses are now heated to reduce water condensation accumulation caused by the humidifiers. 3). CPAP Masks – Most masks fall into one of three categories, full face masks that cover the nose and mouth, a nasal mask or a nasal pillow that has soft plastic that fits into each nostril. The good news is that if one CPAP mask or device doesn’t work for you, you have other options. Everyone has a unique facial structure which is why it is so important to be mask fit by someone with experience in order to select the right style and size mask for you. And most CPAP masks are adjustable, to help make them more comfortable for you. Most masks fall into one of three categories, full face masks that cover the nose and mouth, a nasal mask or a nasal pillow that has soft plastic that fits into each nostril. It’s important to work closely with your CPAP provider to make sure you have a mask that fits you properly. Most masks come in different sizes. Just because you’re a certain size in one mask doesn’t mean you’ll be the same size in another. A good CPAP provider will show you how to adjust your mask to get the best fit and maximize comfort. • A large range of CPAP mask styles and sizes are available. For example, some masks feature Nasal Pillows that fit into your nose and straps that cover less of your face. These can be less cumbersome, but may not work well if you require higher levels of air support. • Nasal masks may work well if you wear glasses or read with the mask on, because some styles obstruct vision less than do full face masks. However, they may not work if you move around a lot in your sleep or sleep on your side. • Some CPAP masks are “Full Face” which cover your nose and mouth, with straps that stretch across your forehead and cheeks. These may be less comfortable, but they work well at providing a stable fit if you move around a lot in your sleep. Full Face masks also work well if you tend to breathe mostly from your mouth while you sleep. CPAP Hose –The hose is simply the delivery device that transports the pressurized air from the motor to the CPAP Mask. While most hoses are 6 feet in length, the diameter of the hoses can be different depending on the machine that one uses. Most hoses are now heated in order to reduce water condensation and reduce any accumulation of water inside the hose. Humidifiers – Add moisture to the air coming from your CPAP machine in order to help reduce irritation to the nasal passages. Dry air can be uncomfortable leading to swelling and possibly narrowing of the airway. Many PAP (positive airway pressure) users experience nasal congestion and dryness of the nose and throat during treatment. This can be especially problematic for new users who are adapting to treatment. Humidification adds moisture to the air helping to reduce the symptoms of dryness and congestion. The two main kinds of humidifiers include: passover (cool) and heated. A passover humidifier means that air simply passes over a small water chamber at room temperature. A heated humidifier has a metal plate underneath the small chamber that heats up the water allowing it to pick up the moisture in the air. It is best to use distilled water to help keep your humidifier chamber clean and mineral deposit free. Tap water should not be used as it will leave hard white mineral deposits in the chamber as the water evaporates, or it may lead to mold growth. CPAP Accessories –There are many CPAP Accessories now available to increase comfort with Therapy including: Nasal pads which can be placed over the bridge of the nose to help protect the skin from pressure sores developing, Chin Straps are often used if you are experiencing excessive mouth leaks and or dry mouth, Headgear can also be customized in order to improve fit, hose covers are used when sleeping in cold environments or if you have a non-heated hose in order to reduce rain-out or moisture from forming in the hose, CPAP hose lifts are designed to keep your hose from becoming tangled in your blankets while you sleep, CPAP pillows are specially designed so minimize mask leaks particularly for side sleeping, CPAP batteries allow for portability of your equipment so that you can enjoy going cord free while camping, for example. There are also accessories related to proper CPAP equipment maintenance including CPAP hose brushes and small machines you can purchase to clean your mask. CPAP is a form of positive airway pressure ventilator, which applies mild air pressure through a mask on a continuous basis to keep the airways continuously open in a patient who is unable to breathe spontaneously on his or her own. It is the Gold Standard treatment for Obstructive Sleep Apnea. When you use CPAP, your bed partner may sleep better too. You will feel more alert during the daytime , your mood will improve and you will have a better memory. Even one night of not using the machine can make you sleepy the next day. CPAP is a lifestyle change. The more you use CPAP, the better you will feel. It works best when used every night, for the entire time you are sleeping. CPAP can lower your blood pressure. If you are currently taking medication for high blood pressure and begin using CPAP Therapy your Doctor may be able to reduce the amount of medication you are taking or it’s possible that you may no longer need it at all. It’s best to ask your Doctor about this. CPAP improves heart rhythms and by treating your sleep apnea, you can reduce your risk of heart disease. The breathing pauses in sleep apnea cause changes in your blood pressure and can reduce your blood oxygen levels. This puts an enormous strain on your heart. Using CPAP therapy over an extended period of time can protect you from heart problems like, congestive heart failure, Coronary artery disease and Irregular heartbeat and reduce your chance of dying from them. A stroke is a sudden loss in brain function. It occurs when there is a blockage or rupture in one of the blood vessels leading to the brain. If you have sleep apnea, consistent CPAP use can reduce your risk of stroke, one of the leading causes of death and long-term disability. Using CPAP to treat your sleep apnea can improve insulin sensitivity. Sleep apnea is related to glucose intolerance and insulin resistance, both factors in type 2 diabetes. Sleepiness and daytime fatigue are common symptoms of sleep apnea. CPAP can restore your normal sleep pattern which will wake up feeling more refreshed and boost your energy throughout the day. 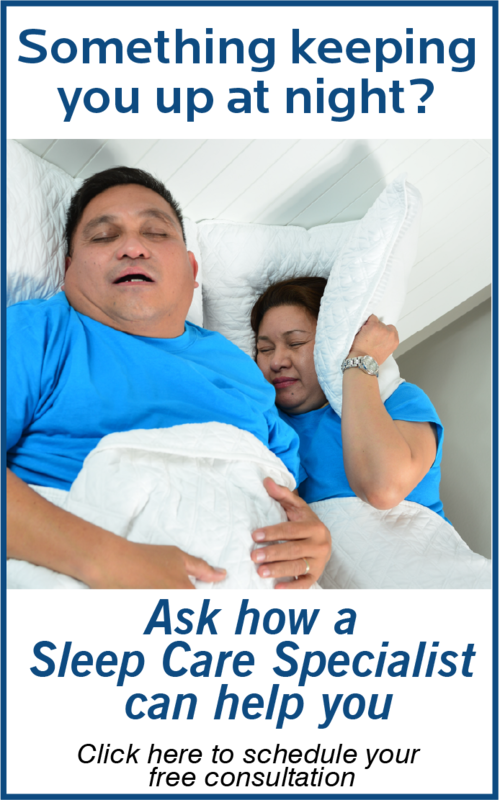 CPAP reduces or eliminates the sound of your snoring by keeping your airway open. Using CPAP may improve your ability to think, concentrate and make decisions. Sleep Apnea Therapy can improve your productivity and decrease the chance of a accident occurring due to the reduced ability to respond to reaction times while at work or driving. You are seven times more likely to be involved in a motor vehicle collision if you have untreated sleep apnea. CPAP can help improve your mood, reduce your risk of depression and improve your overall quality of life. All forms of PAP therapy can improve your sleep by splinting open your airway via a stream of air through a mask. Bi-Level positive airway pressure (Bi-Pap) devices have two alternating levels of pressure. When you breathe in air, the pressure rises. The pressure decreases as you breathe out. Some patients may be diagnosed with a more complicated form of sleep apnea requiring Bi-Level (Bi-Pap) therapy. Nasal pillows “silicone pillows – that fit comfortably inside the nares. These masks are less obstructive than the full face masks and have small pads that fit into your nostrils. They are very effective masks that will aid in your therapy. A small interface that fits on your nose (make it sounds less threatening). Full Face an interface that fits on your nose and mouth. These masks are great for those people that are considered mouth breathers. They provide a great seal and work well with most faces. Having a beard may affect the seal but nevertheless they are great masks. These masks are specifically designed for children. They take into account many factors of CPAP therapy. There are such a variety of masks for specific issues so contact our therapists for additional information. Humidifiers for CPAP can help reduce side effects by providing cool or heated moisture to the air coming from the CPAP unit and make it easier for you to breathe through your mask. 1). Begin using your CPAP for short periods during the day before bedtime in order to give your brain: a chance to adjust to the feeling and affects of the therapy. Even twenty minutes while reading or watching TV will help. 2). CPAP is not a quick fix for your problem. It involves a long-term commitment to improve your sleep and your health. Make CPAP part of your bedtime routine, for every nap even. 3). Make sure your mask is a good fit. The most common problems with CPAP occur when the mask does not fit properly. Increase your level of comfort by using a saline spray, decongestant or heated humidifier if CPAP irritates your nose, mouth or throat. Use your unit’s “ramp” setting to slowly get used to the air pressure level. Clean your mask and tubing on a regular basis. Put this time in your schedule so that you don’t forget to do it. Check and replace the filters and tubing for your CPAP unit and humidifier. Make small adjustments to the mask straps to increase your level of comfort. 4)· If the pressure feels too high as you are trying to fall asleep, use the “ramp” mode on your CPAP unit. 5). Clean your mask and tubing on a regular basis. Put this time in your schedule so that you don’t forget to do it. Check and replace your mask, tubing, humidifiers, and filters regularly. 6). Your adjustment to CPAP will be easier if you are able to connect with others who use the same treatment. Ask your CPAP supplier if there is a support group in your area for people who have sleep apnea, or look for one on the internet. Remember it takes some patients longer than others to adjust to CPAP therapy. So please have patience.